Quarterbacks. Denard Robinson has planted himself firmly in the starting position with his other-worldly performance early in the year and his promising, albeit mistake prone games against Iowa and Michigan State. 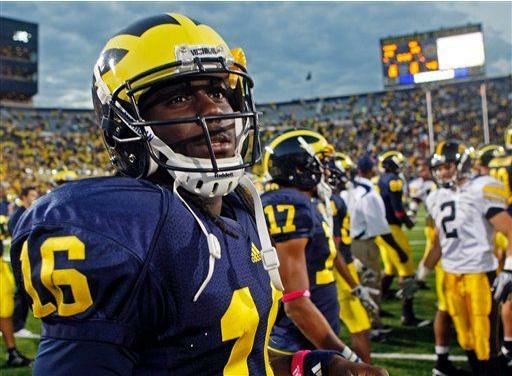 When Denard has been on his game, he's more or less single-handedly carried Michigan to victory. Unfortunately, he's been sporadic of late. When Denard has been out of the game, Tate Forcier has relieved him to resounding effect. Which is to say that Michigan finally has depth at the most important position on the field. Behind Forcier, we've seen brief, unimpressive appearances from true freshman Devin Gardner. Gardner now has some injury concerns and may be able to apply for a medical redshirt which would be best for all parties involved. Denard still has a lot of work to do. His recent plague of interceptions in the last two games show his infancy in the passing game and will present problems going forward against defenses like Wisconsin and Ohio State. So while Denard has shown he can lead Michigan to extraordinary heights, he also presents the same problem that Michigan encountered last year: You live by the Focie... Shoelace, you die by the Shoelace. Running backs. Michigan's running backs have been, in a word, unimpressive. This blog projected that Vincent Smith was going to come into the season as the starter, but an off-season ACL surgery put him behind the 8-ball. Mike Shaw has been the nominal starter and has fluctuated between mediocre and pretty good. Smith, meanwhile, hasn't shown much aside from showing a few flashes of Mike Hart-itude. On the more positive side, Stephen Hopkins has come on in the last two games and shown that he's more than just a short yardage back. Hopkins provides the size that Michigan's other backs can't, but more impressively, he's shown unexpected quickness and good lateral movement. If Hopkins continues to improve the way he projects to, he could be Michigan's starter next year (alongside recent verbal commit Demetrius Hart, who looks to make an immediate impact on a lackluster backfield). Wide receivers/Tight ends. This could look identical to the running backs section above. Michigan has a bunch of Big Ten average wide receivers that all get the job done. Roy Roundtree, as expected, has been the most targeted receiver of the year, as he was at the tail end of 2009. Darryl Stonum has also improved from his sporadic 2009 season and become a consistent threat. The most encouraging sign in recent weeks, however, has been the emergence of injury-plagued Junior Hemingway. After recovering from yet another injury, Hemingway has proven that he's the most consistent downfield threat for Michigan and might have the best hands on the team. In less encouraging news, frequent workhorse Martavious Odoms broke his foot and will be out for most, if not all of the season. And Michigan's other receivers (Kelvin Grady, Jeremy Gallon, Terrence Robinson, Je'Ron Stokes) have made very little impact. Michigan's tight ends have been largely removed from the passing game and have been used more in the H-back, linebacker-clubbing role. Kevin Koger and Martell Webb have both become some of Michigan's more effective downfield blockers and are vital in Michigan's short-yardage package. This isn't much of a let down as Michigan's offense has enough weapons without them, and they've both been performing exceedingly well in the running game. Offensive line. Aside from Denard's early-season emergence as a Heisman hopeful, Michigan's offensive line has been the most encouraging part of the year. Though they've shown flaws in the last two weeks (primarily issues with stunting defensive linemen and some pass protection issues), the O-line has solidified themselves as possibly the best unit in the Big Ten. Redshirt freshman Taylor Lewan's emergence as a force at left tackle is a huge win for the future of the program. Meanwhile, the healthy return of David Molk has been a godsend (despite, ya know, his injury against Iowa). Steven Schilling was talked up by most media outlets before the season, but he has been thoroughly just-OK. Patrick Omameh has shown some pass-protection problems, but is unstoppable in the run game. And Perry Dorrestein has been unremarkable, meant in the most flattering way. Michigan's offense is in line to be arguably the best in the Big Ten and one of the best in the country. With the health of Denard, however, goes the health of the offense. Despite Forcier's ability to move Michigan up and down the field against quality opponents, Denard is the electricity that makes it run. Surrounding Denard is now a squad that not only has good starters but often equally as good backups. In two years, the offensive line went from one of the team's biggest liabilities to one of its biggest strengths. And at the other skill positions, Denard has playmakers that can do just enough to make this team truly dangerous. However, the lack of a game changer at either the wide receiver or running back position is going to hurt the team down the stretch. Next year, Michigan is going to return almost everyone on the offense (the joys of having a young team) save a few offensive linemen whose backups are firmly entrenched and have shown promising upside. Long gone are the days of the Nick Sheridan/Steven Threet monster that made the future of the program looks hopeless. If nothing else, Rich Rodriguez has turned Michigan's offense into the relative juggernaut everyone expected when he arrived in Ann Arbor, and has the team poised to get stronger on that side of the ball in the coming years. I think you are bit harsh on the WRs. It's true that Michigan lacks the elite wideout -- there's no Braylon or Super Mario on this team -- but the Roundtree-Hemingway-Stonum-Odoms (when he was healthy) quartet was pretty darn good. You say the WRs mirror the RBs and wrote that the RBs were "unimpressive." I have been impressed by Michigan's WRs this season. The wide receivers have caught the footballs that have been thrown to them, and little else. They're functional, much like the running backs. There's no game changer, there's no real deep threat (Hemingway and Stonum don't really classify as deep threats), and there's no one that does anything more than function in the offense, which is to say catch the ball in space and then run seven yards. I think you are being too hard on the receivers as well. The receivers play within the offense and are doing a pretty good job given the scheme they are in. How many times have you seen a well-thrown ball on a vertical in which the receivers didn't make the play if it was there? While I'm not tracking such things, my eyes tell me they have made more plays then they haven't -- especially the late game heroics by Hemingway. Maybe I'm missing some of the more nuanced stuff like the blocking downfield (though I was under the impression they were doing pretty well with that, too). As Chris said, there is no Braylon/Manningham, but that may be more because of the kinds or routes they run than it is about their ability to perform at that level. We have a true sophomore QB who is not ready to be a true downfield threat and an offense that has far more slants, screens and quick outs than anything else. For what they do, they've been doing it reasonably well. I don't think a comparison to the RBs is apt. For perspective, Mike Hart's best YPC was 5.2 in his freshman year (his lowest was 4.4 in his sophomore year). The point being that the running backs are performing at a pretty high level but lack the sort of playmaking ability that makes them truly impressive. The wide receivers are of the same ilk: they function how they're supposed to within the offense but all of them lack the real breakaway speed or moves to make them anything other than average. My only real issue with the running backs has been their failure to get the necessary yards in certain situations. There have been other reasons for stalled drives, but they have been culpable as well. That's why everyone has clamored for more Hopkins given Shaw and Smith haven't been getting the tough/short yards. Also, when defenses started closing on Denard and making the zone read a constant hand-off, it seemed like the backs were not gaining as much traction, though that is from memory and without analysis. This offense is going to get yards rushing, period. Just look at the evolution of 2008 on that disaster of a squad and even in 2009 with Forcier running the offense on a bum shoulder (http://shrt.st/okt - Photo Graphic). It's when the defense stiffens with an ability to either get the yards or the big play that matters. In the first half, that wasn't great. Maybe it's splitting hairs but the WRs seem to grade out as being pretty good, again relative to what the offense is (much like the running backs should be considered).